A HOLIDAY WEEKEND TRIP TO CINCINNATI’S ZOO ENDED UP AS A DOUBLY TRAGIC SATURDAY WHEN A 3-YEAR-OLD BOY WAS HOSPITALIZED FOLLOWING HIS FALL INTO A GORILLA ENCLOSURE- AND ZOO EMPLOYEES HAD TO SHOOT THE RARE GORILLA TO PROTECT THE BOY. Cincinnati Zoo workers shot dead Harambe, a 17-year-old silverback gorilla, out of fear that he would hurt Isaiah Dickerson. Although it is not clear if the gorilla wanted to harm the boy or not, it caused negative responses for the incident. Zoo director Thane Maynard stated: “[The officials] made a tough decision and they did the right pick cause they protected that little boy’s life. Maynard said the zoo’s 17-year-old male western lowland gorilla, Harambe, grabbed the boy and dragged him around. Two female gorillas were also in the enclosure. 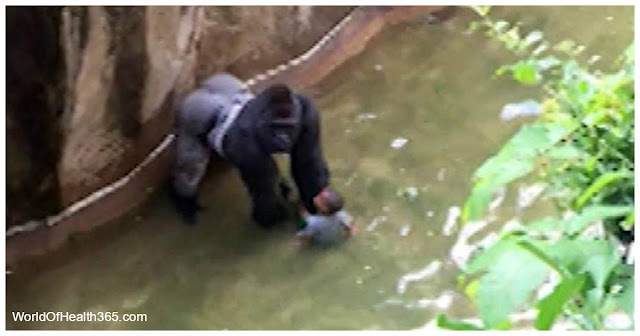 Although Maynard unveiled Harambe didn’t seem to be attacking the child, he explained that in that moment they couldn’t see if it’s a ‘life-threatening situation’ or not, so they had a tough choice. They believed that a tranquilliser may just worsen the situation because it may or may not knock-out the 17-year-old western lowland gorilla right on. The boy was rescued and taken to Cincinnati Children’s Hospital Medical Centre where it was reported that the 4-year-old boy did not have any injuries. However, eyewitnesses to the incident on Saturday have claimed the gorilla was showing no aggressive behavior towards the boy. It is claimed that screams from those watching the unfolding situation panicked Harambe, causing him to drag Isaiah at a quick speed across the water. However, the boy avoided serious injury, but RIP Harambe, another animal taken too soon.Because the latest footage suggests he was NOT at risk. YOU CAN SEE THE VIDEO BELOW BUT HAVE IN MIND THAT THE VIDEO IS A LITTLE STRESSING.